Audacy, fair and square! 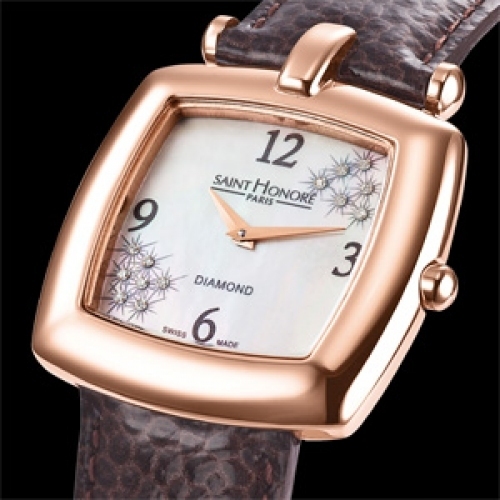 The first impression of the beautiful and intriguing new Audacy watch from Saint Honoré is its square, asymmetric shape. This unique timepiece will make heads turn with its bold, innovative design. With the rounded corners of the case, Audacy differs from traditional square watches and offers an appealing softer shape. 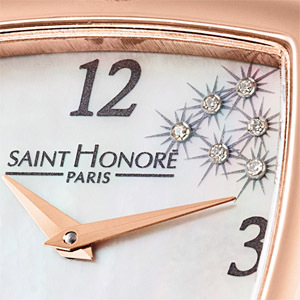 Its enchanting design reflects a multifaceted, feminine world, with its couture styling, collection of dials and sparkling diamonds. The central lug that links the case to the strap gives Audacy its light, streamlined shape, which is perfectly complemented by a choice of highly fashionable patent leather straps. This magical square knows how to melt hearts and soften corners!